With our Ozeki Bulk Messenger software you can send bulk SMS text messages through the Internet with the help of a Short Message Service Peer to Peer Protocol (SMPP) which is offered by mobile network operators. 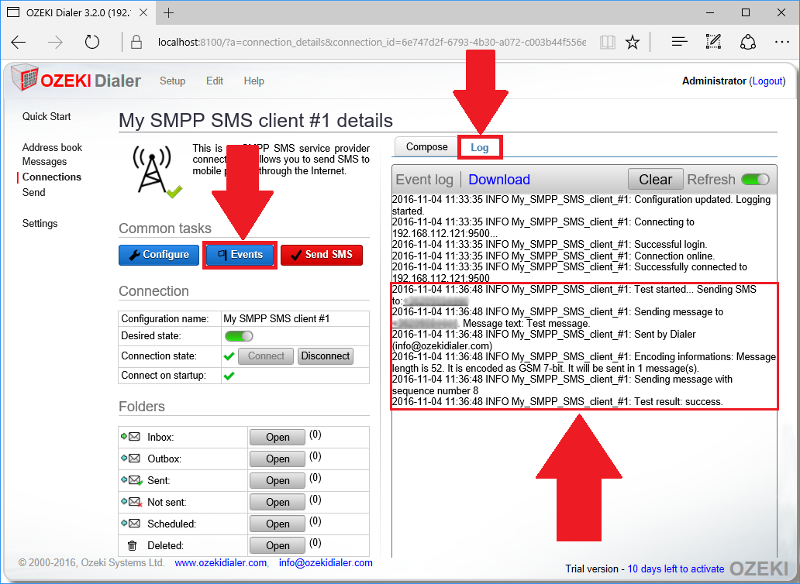 Below we will show you how to setup an SMPP connection in the Ozeki Bulk Messenger. On the left side of the 'Quick Start' page please click on the 'Connections' tab. After that select 'Create new Connection' and in the 'Connection details' window chooose 'SMS'. In this case choose the 'SMPP' type of connection. On the 'General' tab you can configure your connection settings. Provide a unique name which will make it easier to manage your connections. 'Host:' This is provided by your mobile network operator. It is the IP address of the operator. 'Port:' The port number is 9500 by default. You will have to change it to the number you get from your network operator. 'Username:' This is given by your service provider. It is sometimes the phone number or the port number. 'Password:' You also get this from your service provider. 'Phone number:'Enter ESME number or number range. On the 'SMS' tab you can see the protocol options in more detail. 'Bind' menu: This is where you have to provide connection parameters. 'Sender ID' menu: Connection parameters. 'Priority flag' menu: Choose a priority level. 'DCS' menu: The charset, message class and binary message encoding is determined by this setting. 'ESM' menu: Setup ESM class fields. 'Character Encoding' menu: Set the character set and the character encoding policy. 'User data' menu: Specify the encoding requirements of the short message data. On the 'Advanced' tab you can setup optional settings like limiting the speed of your connection with the 'Speed (MPM)' option or you can use the 'Keepalive' mechanism to avoid disconnection while there is no traffic. On the 'Log' tab you can log your messages. Click on the 'Test' button to open the message window. You can also check if your connection is working, if there is a green check mark below the Event log then you are ready to send your test SMS. After you have clicked 'Send', a program message will show up in the middle saying that the sending process has started. On the bottom of the page you will see a green check mark showing that the connection is working. If you click on the 'Event' or the 'Log' tab you can check whether your message was successfully sent to the recipient.